Biking to work is awesome for my mind, body, and bank account, and biking to fun events with friends is even better. Northern Spark 2011 was my favorite urban bike adventure of last summer. If you live in the Twin Cities and aren’t already planning your night at www.northernspark.org, grab some friends and some bikes (NiceRides will do) for the second annual all night festival this Saturday night. This dusk-to-dawn event scatters art projects along the Mississippi, featuring many artists who employ digital technology in participatory projects. Riding around feels like a scavenger hunt, with pockets of bustling creativity as the treasure. The best projects encourage viewers to interact with each other and their city in new ways. Last year, a friend and I began our journey on the West Bank at 2 a.m. Biking was lovely – the air was cool but not cold. The streets were essentially car-free; blinking white and red lights ricocheted off office buildings. There was a lot to do and see. We enjoyed good conversations at Wing Young Huie’s Ping Pong Retrospective, then cruised around the West Bank and St. Anthony Main before watching the sunrise from the Sculpture Garden. My friend still talks about his favorite part of the evening. He was thrilled to pedal the giant, tricycle-powered, fiberglassed, light-up egg in Janaki Ranpura’s Sperm and Egg Hide and Seek. I helped him find a hiding spot as a half dozen people donned glowing bike helmets with long tails, ready to seek us out. This was my first introduction to Janaki’s art. Since then I’ve had other opportunities to experience her work, which combines the ordinary and the fantastical, seamlessly woven together in multi-media, engaging public productions. Janaki often uses bicycles, but not in the way I usually think of Bike Art (face it: “put a bike on it” is the new “put a bird on it”). Bikes are as seamlessly integral to her work as they are to her lifestyle. If a gigantic fiberglass and wooden egg were not mounted to a tricycle, how else would one person be able to hide it? And certainly pedaling is the most appealing way power a generator without making so much noise that the ipod dance party is drowned out. 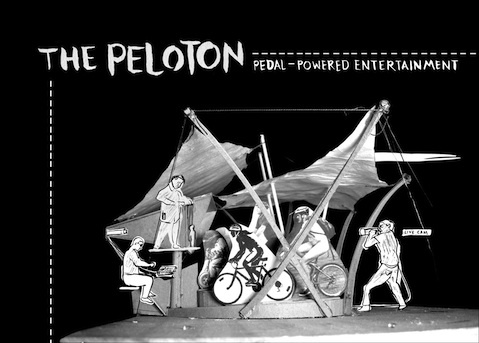 All of this is to say that her 2012 project, The Peloton, is my top pick for what to see at this year. There’s already a nice description of the project here, so I won’t try to replicate it. I got a sneak peek and I can reveal that the Peloton bikes are a gorgeous hue that will make you want to powdercoat your own ride. This year, festival organizers put a specific emphasis on cycling as the best way to get around to different sites. They reached out to local cyclists in the planning process, and the Midtown Greenway Coalition got involved – they’ll be hosting Greenway Glow, a bike lights show and contest. Besides The Peloton, the other project I’m especially excited about is The Kuramoto Model (1000 Fireflies), which will equip cyclists with red blinky lights that gradually synchronize when they’re in proximity with other lights. Check out the video below. Red bike lights are one of those things you can never have too many of! I reserved mine early by donating to the Kickstarter Campaign, and a limited number will be available for free Saturday night. If you want to make SURE you get one, you can stop by The Soap Factory on Thursday, June 6 between 5 and 7 p.m. and donate $10 to Northern Spark. There’s a lot to do Saturday night! Plan it out beforehand or just follow your fancy. Join the early crowds or get to know the true night owls. However you do it, just go. Since events go until dawn, no amount of previous commitment can excuse missing this. And if you see a woman with a blue bicycle who looks as excited as a kid at Christmas, it might just be me, because this is one ride that has been on my calendar since the morning after last year’s Northern Spark.